nce upon a time, there lived a girl so lovely that whoever saw her thought that she must be a fairy princess, she was so very beautiful. Her name was Aurora. 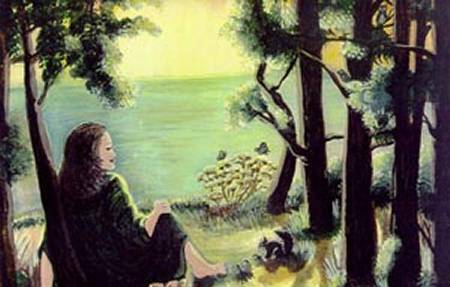 Aurora lived on the edges of a great forest. Every morning before first light, while the stars were still shining far above, Aurora would come out into the meadow, to delight in the fresh smells of the dawn and to listen to the Earth being very still. Aurora would slip out somewhere from between the strong silent trees, when it was still so dark that you couldn't see the trees. You could only feel their good strength here and there around you. She would walk barefooted into the soft grasses of the meadow and listen to the silence all around. One day the sons and daughters of Man came and cut down some of the trees. They put up in their place many boxes  boxes to live in, boxes to work in, boxes to shop in. Part of the forest was gone. Aurora was sad ... she loved the forest and didn't love the boxes very much. What could she do? She thought that maybe it was time for her to move far, far away ... but first, she wanted to say good-bye to her new friends, John and Sylvia. As she told them that it was time for her to leave, Sylvia begged her to stay ... maybe there would be a way to preserve the forest and have places for the sons and daughters of Man to live in, work in, shop in, and play in. Aurora had never thought about that! Sylvia and John then told her that the Elders had taught them things, special things, and that maybe ways could be found to have the best of both worlds.